An amazing smartpen that remembers everything you write, say and hear. The Smartpen lets you capture thousands of pages of notes and hundreds of hours of audio. 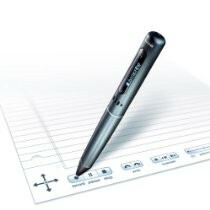 With Livescribe's Smartpen you'll never miss a word. Smartpen lets you capture everything you write and hear and save important data in simple pen-and-paper format, making it easy to access, organize and share. Depending on what setting you have it on, the Smartpen holds 200-400 hours of audio, and thousand of pages of notes, which makes it ideal for meetings, conferences, and classes. The Smartpen records a digital image of anything that's written on the dot paper. As you write with the Smartpen, a small camera just below it is imaging your writing. An audio recorder is also recording what is being said, whether it is you speaking or a lecturer. The audio will sync with the text if the internal microphone is enabled. You can transfer your notes to your computer, organize them, share them, and even search for words within your notes. You can also transform your notes and audio into interactive movies. After recording, simply tap the pen or click on any word to hear what was being said at that time. Miss something? Tap on your notes with the tip of the Smartpen to hear what was said while you were writing. The Smartpen is a little larger than a permanent marker and weighs a little more than a ball point pen. It is hard plastic with a rubber exterior. The Smartpen is flattened on one side to help prevent it from rolling around. The Smartpen comes loaded with apps and is ready to use right out of the box. You can customize the Smartpen with more free and paid apps. The paid applications run about $2. There are over 70 available applications, and they range from productivity and reference tools, to games and entertainment, to travel and education. The Smarpen allows you to launch the applications simply by drawing a line and writing the name of the application above it. This is an amazing pen. I never knew such a thing existed.